All Staveley Hockey Club news stories will appear here. Got some news? 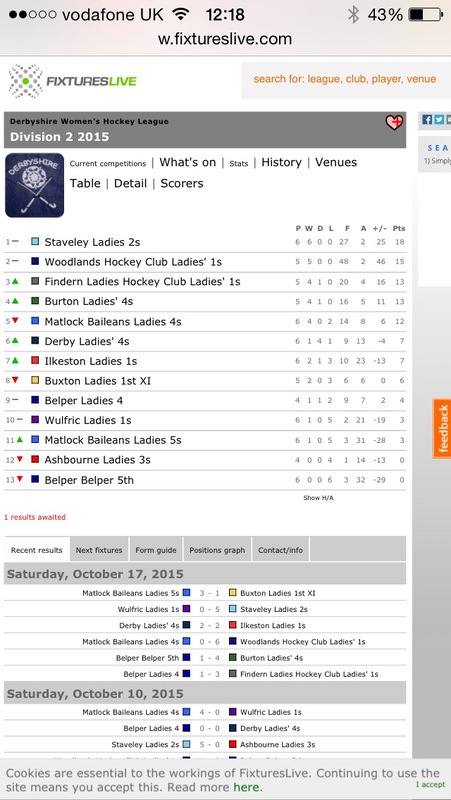 Email staveleyhockey@hotmail.com. Training for the new season starts next week! The new season is almost upon us so it’s time to pull on your shin pads, pop in your gum guard and dig out your stick… training is back! Our first session is next Wednesday (7th September) from 7-8, at St Mary’s so please come out and boost the ranks for a good turnout. Not played in a while, don’t worry, come along and give it a go! There’s room for a whole new crew of Hollie Webbs and Alex Dansons at Staveley. Staveley Firsts are taking on Woodlands this Saturday in the League Cup Final at 10am at Antony Gell School, Wirksworth. If you can, why not pop down and cheer them on!!! Today’s game was against Phoenix, after playing them in pre season we knew what to expect. We started the game 3,4,3 with Lydia starting centre mid along side Anna as she had a stormer in training. We had a lot of possession in the first half but got frustrated as we couldn’t find the back of the net. Just before half time from out of no where, Linz shot from a tight angle to beat the keeper at the near post. The second half saw us start much better, with more link up play going forward. Loz won a short and Linz made it 2-0. More good play down the right saw that Andrea got her first goal of game with a pull back from the right to find the back of the net. Phoenix caught us a few times on the break, but the defenders and Charlie both had a super game for us to keep a clean sheet. More good play from down the right saw Lydia and Nuala linking up to to find Linz for her to pull back for Andrea to slot home. Staveley had plenty of shots in the second half but their second half keeper kept a lot out. 5-0 finish! Well played ladies, onwards and upwards! 3 goals from Linz, 2 from Andrea, player of match Isabelle. 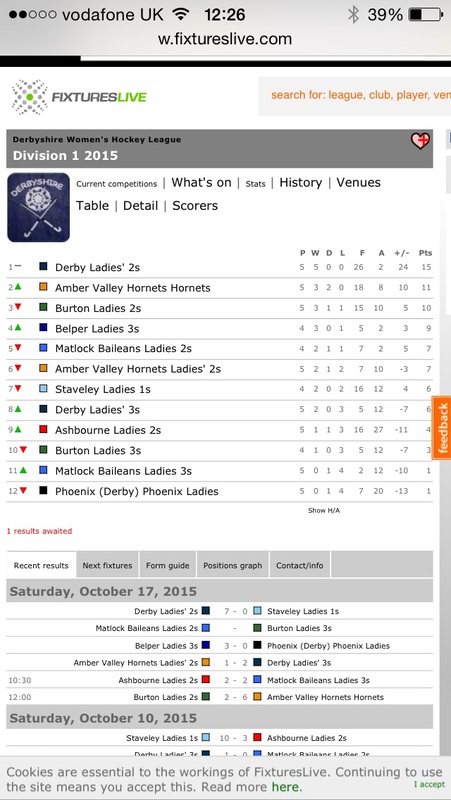 Staveley 1sts retain their mid-table position after a tough game against table leaders, Derby. It’s early days and with a game in hand, there’s plenty of time to make an assault on the top of the table. The league tables have been updated! It’s true what they say about you only playing as well as your opposition. The game starts with Wulfric a man down. After a scrappy start and several penalty corners awarded, Rachel stepped up to take a penalty flick. She lifted a lovely ball into the bottom left corner, but unfortunately had taken a bit too early. A retake had interrupted her concentration resulting in the keeper taking advantage and the flick was saved. Clearly frustrated by the turn of events, Rachel’s determination then saw her tear up the pitch until she was finally rewarded with a well deserved goal! Leaving us one up at the end of the first half. Our half time team talk led mainly by Ange, who said it how it was and that we were simply paying as bad as them! Captain pointed out we are top of the league players and should play like them! The second half saw a very different Staveley team take back to the pitch. We were all over them. Jen, true to her nickname ‘The Tasmanian Devil’ whirled round the pitch, only ever stopped by the referees whistle, usually for no reason at all! Some great play continued. We created spaces for some good passing and eventually Lauren managed to put a second one away! Meanwhile, Jen still tearing up the pitch, baring in mind she was playing left back, took some great shots at goal and a cracking lift from the edge of the D which flew in the goal, only for it not to be allowed! Should anyone know the reason for this please reply to http://www.haventgotaclue! Thought she was going to erupt! The rest of play saw every single player taking advantage of Wulfric’s distinct lack of enthusiasm and Lauren put away another 3, she was on fire. Victory was ours ending 5-0. Well deserved MOM to Rachel. Give us a cheer for yso….